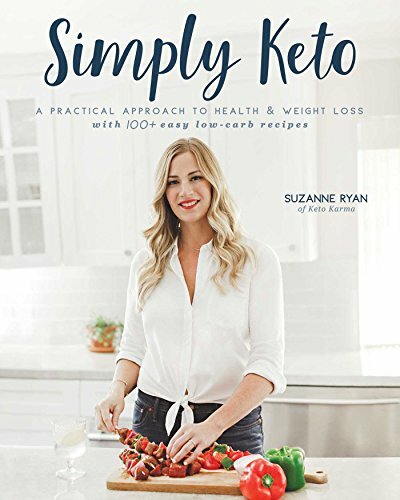 If you’ve spent any time looking for recipes online in the last few months, it’s likely that you came across the term “keto diet.” The keto diet (ketogenic diet) is a low carb diet that has been gaining increasing popularity recently. But it’s not a fad! When done properly, the keto diet can be safe and effective and lead to a healthier lifestyle. The hard part is learning what is and is not allowed on the diet! 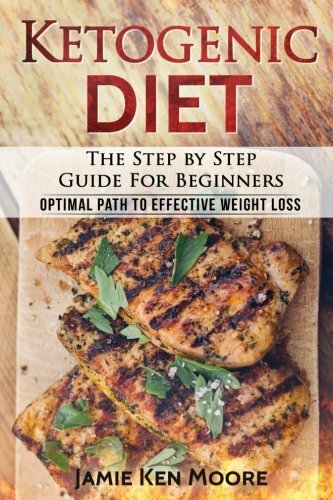 To help you out, here is The Keto Diet for Beginners! I have a handy printable keto food chart printable available at the end of this post. 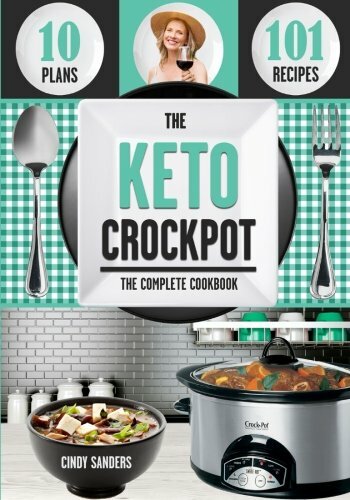 The keto diet is based on a very interesting idea. The goal of the keto diet is to reach a metabolic state called ketosis. Ketosis is a state that the body reaches when sugar sources are low. When your body is in a state of ketosis, it creates ketones to use as an energy source. Ketones are produced by breaking down fats in your liver. If you can maintain a ketosis state long-term, you can see a lot of health benefits. The trick is getting your body into that state and keeping it there. Luckily, the keto diet has this all figured out. By eating a high fat, low carb diet you can put your body into ketosis and reap the benefits of all those ketones! The benefits of the keto diet include better heart health, easier weight loss, improved brain health, among other things. The keto diet may also lead to high cholesterol or kidney stones, among other possible side effects. It is also possible to reach a state called ketoacidosis, which is where your ketone levels get way too high and your blood becomes acidic. Be particularly wary about this if you have type 1 diabetes. High levels of ketones can lead to insulin secretion. Nursing mothers and people taking medications should also be careful with the keto diet. If any of your keto symptoms get bad, you’ll want to stop the diet and see a doctor. Because the strict regimen of the keto diet may be a bit too extreme for an individual’s system, it is advised that you do have 1-2 days a week where you eat more carbs. This will help reduce the risk of reaching ketoacidosis and balance out your system. 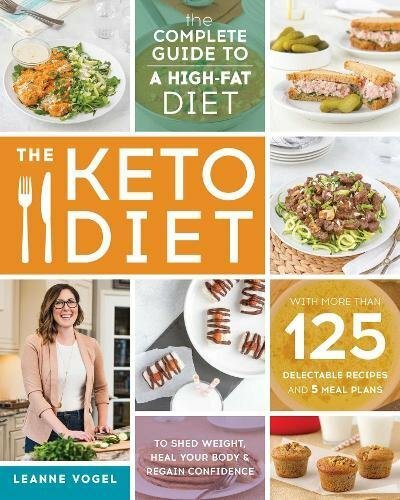 Now let’s get into the main part of this guide to the keto diet for beginners. What you can eat? Remember, everything on this list assumes you’re getting a “real food” version of what’s listed. So if it says yogurt, it means a non-processed, healthy yogurt and not one full of added sugars or designed to taste like a chocolate bar. And since the ketogenic diet is a high-fat diet, don’t get any low-fat varieties. Also, get non-GMO or organic versions when possible for the added benefits that come with those kinds of foods. Dairy- Whole fat dairy. Includes butter, cheese, whole milk, yogurt, etc. Fruits- Low sugar ones only. Includes tomatoes, lemons, and avocados. Vegetables- No starchy veggies (like potatoes or corn), but most vegetables are keto friendly. You can eat plenty of leafy greens, broccoli, bell peppers, carrots, cauliflower, onions, and zucchini, among others. Red meat- Any red meat. Avoid processed meats soaked in sugary marinades/sauces. Poultry- Red meats are best, but you can also eat poultry. Eggs are also a great choice. Seafood- Healthy fish with a lot of omega-3s like salmon are best. But you can also eat cod, sardines, anchovies and others. Shellfish- Virtually any shellfish, including lobster, crab, shrimp, and clams. Nuts- Any low carb nuts. The best are macadamia nuts, pecans, and Brazil nuts. But you can also eat almonds, peanuts, walnuts, and others. Seeds- Not a necessity in the keto diet, but fine for a snack.. They do have a lot of carbs, but its usually non-digestible fiber carbs. If you love nuts you can still eat pumpkin seeds, sunflower seeds, chia seeds, and flaxseed. Oils- Healthy oils only (avoid processed oils like canola, grapeseed, and soybean oil). Olive oil, avocado oil, and coconut oil are all good choices. Condiments- These vary a lot between brands, so make sure to read the labels. But usually you’ll find its safe to eat almond butter, peanut butter, tamari sauce, salsa, pesto, mayonnaise, and stone ground mustard. Snacks- Low carb, lower sugar snacks only. These include beef jerky, dark chocolate, cacao powder, pork rinds, and so on. Drinks- Low sugar, healthy drinks only. This includes coffee, tea, obviously water. Kombucha is also fine, but check the sugar content. Not all brands are equal. 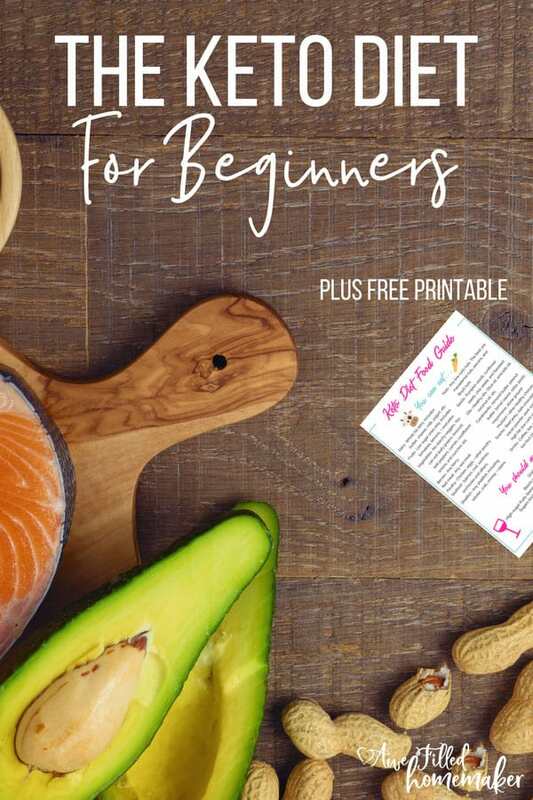 This wouldn’t be a complete guide to the keto diet for beginners if I didn’t also mention foods to avoid! Grains- Grains are too full of carbs. And remember, gluten-free does not mean grain free. Beans and legumes- Beans/legumes have too many carbs. And yes, this includes green peas. High-sugar fruits- Bananas, oranges, grapes, mangos, etc. Also avoid fruit-based products like fruit juices and fruit-based smoothies. Sugar products- Avoid all sugars, whether they’re considered healthy and unhealthy. This includes honey and maple syrup. Artificial sweeteners- These may mess up your ketosis so avoid all of them. Alcohol- All alcohol. If you can’t give it up completely, hard liquor is your best choice. So there you have it! That’s the keto diet for beginners. 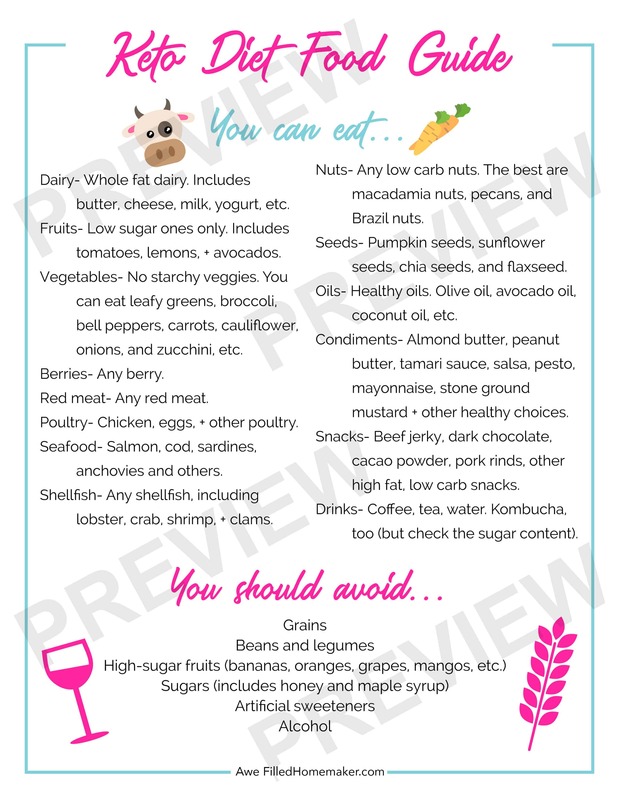 For an easy reference guide when you’re in the grocery store, print out my keto food guide chart printable. 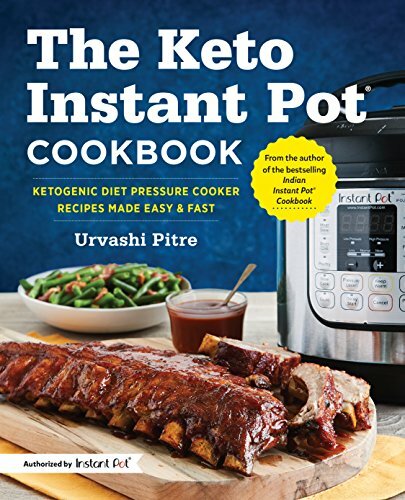 Because the keto diet is based on such a complex idea (achieving and maintaining ketosis), there’s much more highly detailed info out there if you’re interested. But to get you started, this is all you need to know. Enjoy keto! 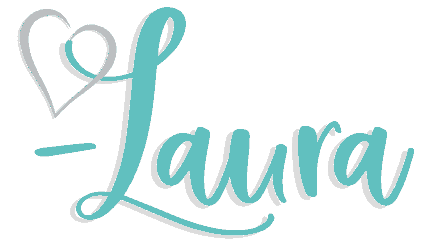 Have you ever tried doing a low-carb diet before? ***Disclaimer- I am not a Dr or medical professional. The above post is just my opinion on this diet. I hold no responsibility in it success or failure for others.